*Market opens at 9 am: Sensex crashes 1,000 points, slips below 34,000-mark; a whopping Rs 3 lakh crore washed away in a matter of seconds. *11 am: Market remains panic-stricken; Sensex at 33, 922.92 pts. *12 am: The barometer regains 34,000-mark, recovery gains momentum in late afternoon and index trades at 34,249.83. *3 pm: As investor sentiment takes another hit, the benchmark index almost fell below key 34K mark at 34,027.32. *4 pm (close): Sensex just manages to end above 34,001.15, still a huge loss of 759 points compared to previous close. Investors lost Rs 2.69 lakh crore. Such was the volatility in the stock market on terrible Thursday, after the US market fell like ninepins the previous day. The US market turmoil first impacted the Asian market and then contagion spread to India. NSE Nifty 50 closed 225.45 or 2.16 per cent down at 10,234.65. The broader market fall was equally sharp with BSE mid-cap index ending 2.34 per cent lower and BSE small cap index 1.41 per cent lower. 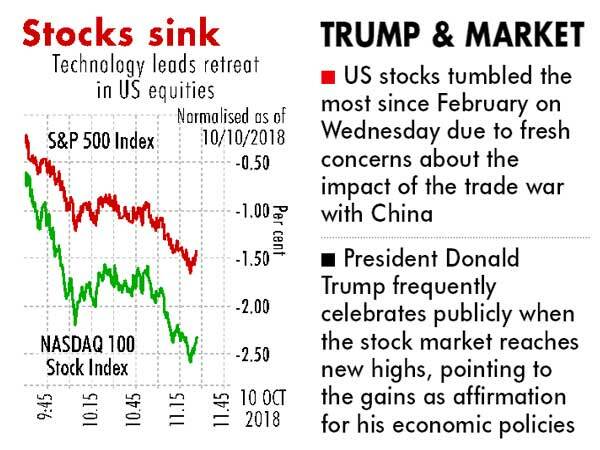 The US stocks tumbled Wednesday the most since February as fresh concern about the impact of the trade war with China roiled technology and industrial shares. The broad selloff took the S&P 500 to the lowest in three months, the Dow Jones Industrial Average plunged as much as 836 points and the Nasdaq 100 Index tumbled more than 4 per cent for its worst day in seven years. The selloff came a day after the International Monetary Fund said the world economy is plateauing and cut its growth forecast for the first time in more than two years, blaming escalating trade tensions and stresses in emerging markets. Trump has slapped tariffs on $250 billion in Chinese goods this year, and Beijing has retaliated with levies $110 billion of American products. Commenting on the rout in the US market, president Donald Trump said: “The Fed has gone crazy.” “The central bank is too tight,” he added. White House press secretary Sarah Sanders said in a statement following the close of markets that the US economy is “incredibly strong” despite the selloff, which analysts attributed in part to trade tensions with China. “It’s a correction we have been waiting for a long time,” Trump said. Trump frequently celebrates publicly when the stock market reaches new highs, pointing to the gains as affirmation for his economic policies. Trump was briefed on the market turmoil earlier in the day, a White House official said. He has repeatedly criticised the central bank for raising interest rates this year, decisions aimed at preventing the economy from overheating. In the market correction after August 29 peak, when Sensex touched all-time high of 38,989.65, promoters and investors have become poorer by Rs 23.64 lakh crore as BSE’s total market capitalisation fell to Rs 135.70 lakh crore from its highest level Rs 159.34 lakh crore reached on August 31 this year. The going has been tough in last two months after a bull run that started in second half of 2013 as foreign portfolio investors have sold equities worth about Rs 29,000 crore since beginning of September. Yet again foreign portfolio investors main were the main culprit for the rout in the Indian market with Rs 2,869.41 crore net selling. Rupee’s plunge to new low every day along with fall in share price has led to foreign investors exit from Indian market in a hurry. On Thursday Indian currency touched a new low of Rs 74.48 per dollar before it recovered to finally close 8 paise stronger at Rs 74.12. Brokers and analysts expressed shock and dismay at the way the stocks and indices were getting hammered, partly also because of lack of regulatory intervention in the equity derivatives market and lack of depth in the domestic market. However, the resilience shown after 1037.36 points fall in the morning on Sensex to days low of 33,723 and a pull-back by 601.65 point to day’s high of 34,325.18 was a tough fight between bears and bulls, though bears finally had a better say on day’s trading action. Deven R Choksey, managing director, KR Choksey Shares & Securities, said: “Since Indian market don’t have enough depth, FIIs are selling daily, in panic and with whatever volume possible.” “It very unfortunate that regulators and market participants are still not making derivatives delivery settled,” Choksey said adding “Investors are paying very high price for deficiency of Indian markets,” he added. Sameet Chavan, chief analyst, technical and derivatives, Angel Broking said, “The correction in our market started mainly because of the domestic concerns and now global woes started creating further panic across the globe. “After Wednesday’s smart relief rally, no one would have expected such kind of terrible start. But, it’s beyond anyone’s control and this time, the global concerns spooked the market participants. At the close, things certainly do not seem horrifying as the index managed to hold its key levels of 10200, which is an indication that probably the sellers have exhausted at least for a while,” Chavan said. While buying in badly beaten down bank was seen on Thursday, it is too early to expect a relief rally overall in the market, said analysts.